This installation introduces Millennium Development Goal (MDG) 2 ("Achieve universal primary education") and the importance of receiving education given its impact on future achievements in everyone’s career. Through our installation, we aim to emphasize the importance of school attendance by showing highlights from the life stories of famous inventors. Therefore, we have chosen famous personalities who – despite being born in underprivileged families where they faced a number of difficulties – were able to overcome the difficulties they faced and today we enjoy the advantages from their inventions. They were successful, but what chance do the children of today have of serving future generations through their creativity or ideas when they have the talent but not the opportunity to attend secondary schools? Our primary goal is to inspire and motivate our visitors to establish the grounds for achieving universal primary education. On the exhibition board, we introduce the lives of five famous inventors and their significant inventions (George Stephenson, Michael Faraday, Abraham Ganz, Richard Trevithick and Thomas Alva Edison). 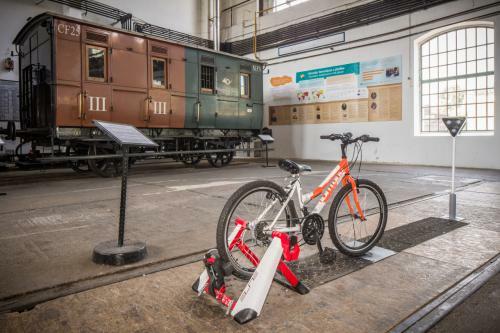 As an interactive element, we put a bicycle in the museum’s exhibition hall. By sitting on and pedalling the bike, visitors drive a connected dynamo (Faraday) that runs the railway traffic light. As they pedal faster and faster, the white light will switch to red. The bike drives a dynamo (which connects Faraday’s disc dynamo invention to our interactive element) and the traffic light flashes (in reference to Edison’s light bulb). This little toy emphasizes that we have many very important inventions that were invented by persons whose talent was almost wasted. We also aim to draw visitors’ attention to the obvious correlation between the education system of a country and its average labour income and economic gain. The board contains two world maps demonstrating this concept, helping participants to understand the correlation between child labour and education standards in a country. We also highlight the significant improvements in some so-called developing countries such as Burkina Faso, Madagascar, Guinea and Mauritania, where the number of children receiving primary education rose significantly during the 19th century. We would like to share this encouraging progress in Africa through the use of exhibition boards. This installation is linked to MDG 2 ("Achieve universal primary education") in every part of the world. Sitting on and pedalling the bike, the visitor drives a connected dynamo that runs the railway traffic light. As the visitor pedals faster and faster, the white light switches to red. We were looking for a topic that fits the profile of the Museum and the MDGs. Since we wanted to emphasize the importance of education, we searched for famous inventors who had contributed to the development of the railway in some way. In addition, they all had one thing in common: they faced serious difficulties and struggled during their school years. We also designed an exhibition board and an interactive installation that shows visitors famous inventions in use. More specifically, it is a bicycle that, with the help of a dynamo, activates the lights at a railway level crossing. Using the Museum’s own library with the help of professional museologists and using the internet for biographical information, we searched for world-famous inventors whose inventions are connected to railways in some way. From the initial selection, we finally chose those who had struggled during their school years, possibly due to their social background or to an illness. We also collected data on current educational difficulties in so-called developing countries and the correlation between education systems and economic development in developed countries. In conjunction with some colleagues, we chose the five famous inventors that we wanted to present and produced short extracts from their biographies. Furthermore, we collected facts and figures on the topic of worldwide education. After receiving bids from different graphic designers, we made our decision. We then involved him in the process of planning the exhibition board. It took us some time to identify an enjoyable interactive element for this installation. One of our colleagues fabricated a bicycle that is connected to a dynamo. Through pedalling the bicycle, the dynamo generates electric power that, in turn, switches on a railway traffic light. Staff members from the museum fixed the exhibition board to the wall in the museum’s Orient Hall. Next to it, the interactive bicycle and the traffic light were placed. We placed an information sheet on a music stand next to the bicycle. The board is in an easy-to-read format with short texts, spectacular figures and graphs illustrating educational and social developments. The installation is very thought-provoking and raises the question of how many outstanding talents are wasted throughout the world because many countries cannot meet even basic educational needs. It was difficult to find famous people whose inventions facilitated the development of the railway and who also struggled during their school years. During the preparatory phase we had imagined that the research was going to be easier. Preparation and research took much longer than we had previously envisaged, which is something to bear in mind for the future.